Rabbis note the firecrackers are life-threatening and that the Torah forbids purposely endangering one's life. Ashkenazic and Sephardic Chief Rabbis, Rabbi David Lau and Rabbi Yitzhak Yosef, called on the Israeli public not to use firecrackers on Tuesday to celebrate the upcoming Purim holiday. "As the days of Purim merrily approach us, we are turning to parents, teachers, and our beloved children and teenagers to avoid using firecrackers, detonators and other types of explosives," an official statement read. "Our holy Torah warns us in the mitzvah (commandment) 'you shall preserve their very souls' [. . ] as handed down by Maimonides and the Shulchan Aruch, 'it is a positive commandment to remove any obstacle which endangers lives.'" "We already know from experience the danger that these explosives can cause, as they make a popping sound which startles everyone nearby and have cause several tragedies and accidents over the past several years," the Rabbis continued. "Therefore, we call to prevent explosive materials from being used, traded, or distributed, and call on our dear parents and teachers out of love to use their influence to prevent children from using them, without exception." 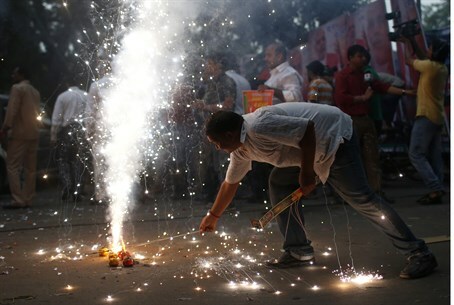 Firecracker use becomes common near Purim, as the festive holiday is traditionally accompanied by different customs and ways of showing merriment. Medical experts noted to Arutz Sheva last month that they have continued to see an unprecedented number of tragedies from firecrackers and warned that they are more dangerous than they appear.